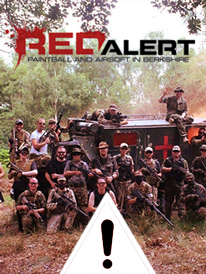 Come and try airsoft for yourself……you will not be disappointed. Newbury Airsoft is a sport like Paintball but is more akin to Military simulation with full sized realistic weapons that can fire 6mm round pellets fully automatically at distances of over 50m. Airsoft is a fun, exciting, team-based sport where you can put in as much or as little physical effort as you like. Charge the enemy stronghold in a mad rush, stalk around the flanks, snipe from the back or sit in ambush for the opposition to come by: the choice is yours – there is something for everyone no matter your fitness level. We have players from 14 to over 60 from all walks of life, from Students to Doctors, Police Officers and ex-Military. At Red Alert we always strive to have a fun, warm and welcoming environment for every player no matter their age or experience. We play a variety of game types from a simple 30 minute simple the base game to more themed games lasting 1-2 hours with storylines involving rescuing a downed pilot or disarming a nuclear reactor about to go critical. Sounds Great! When can I play? We currently hold Airsoft Skirmishes every other Sunday, check the calendar for dates and our rules and pricing pages for more information on pricing. If you don’t have you own gear, we have guns and safety equipment available to hire.